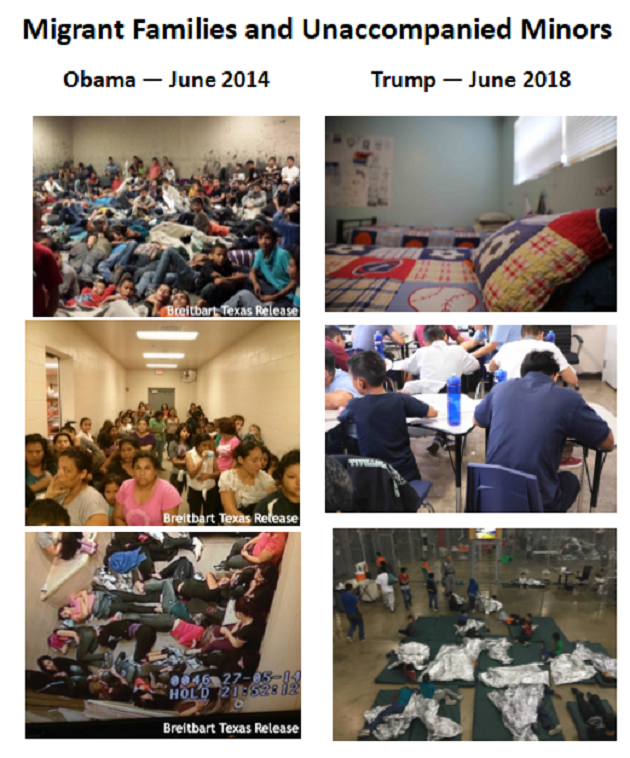 Presidents Barack Obama and Donald Trump were both faced with the issue of unaccompanied minors and family units following the passage of a law by a Democrat-controlled Congress and signed by President George W. Bush in 2008. The law, intended to curb human smuggling, became a magnet for families and children to the U.S. border. The Trump Administration could not agree more with the Post’s article. “Once again it is Congress’s job to change the law. We’re calling on them to do exactly that,” White House Press Secretary Sarah Sanders told reporters on Monday in response to criticism of President Trump’s policies regarding families and minors at the border by former First Lady Laura Bush, Breitbart News’ John Nolte reported. The manner in which Presidents Obama and Trump handled what became an overwhelming crisis stands in sharp contrast. Creates magnet for families and minors with the implementation of the DACA Program. Expands magnet with the implementation of DAPA for parents. Keeps news of surging migrant families and minors quiet until June 2014. Warehouses large numbers of families and minors in overcrowded and unsafe conditions. Implements “Catch and Release 2.0,” program to release minors and families into U.S. interior. Prohibits media and congressional leaders from photographing conditions in detention centers. Orders deployment of National Guard to supplement border security efforts. Orders end of DACA program and urges Congress to find a permanent solution. Issues order to stop migrant family “caravans” at the border to prevent overcrowding at shelters. Issues “zero-tolerance” policy for first-time border crossers. Orders increased prosecution of repeat border crossers. Implements policy to remove minors from parents being prosecuted for illegally crossing the border. Improves the quality of living conditions for detained minors. Proposes border walls and fencing to replace decaying infrastructure and increase border security. Invites media and congressional leaders to tour new family and minors detention and processing centers. Shortly before President Obama’s re-election in 2012, he introduced a program that allowed some young people who were brought to the U.S. illegally by their parents to remain in the U.S. without fear of removal. The administration action became known as the Deferred Action Against Childhood Arrivals (DACA) program. The impact on the southwest border was immediate as scores of families and unaccompanied minors began to move to the southern border with hopes of being included in similar programs in the future. 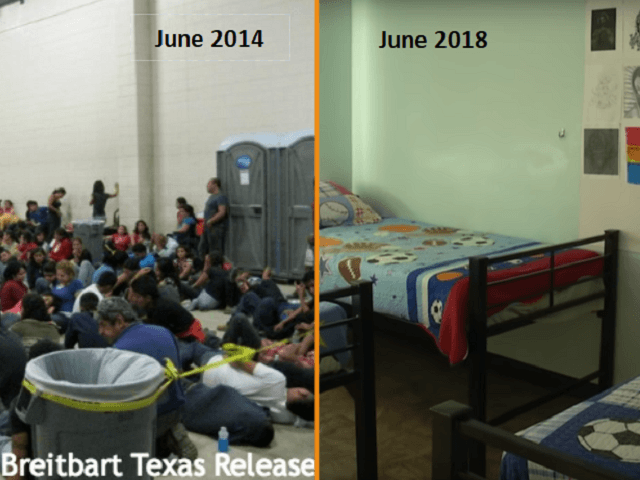 Images published by Breitbart News in 2014 and 2018. The U.S. Customs and Border Protection’s Southwest Border Migration Reports began to show a sharp rise in the apprehensions of migrants. This stood in sharp contrast to the years of decline in border apprehensions from 2000 to 2012. A surge of unaccompanied minors and families began to cross the U.S.-Mexico Border, mostly in Texas, following the Obama Administration’s adoption of catch and release procedures. This month, U.S. Department of Health and Human Services released video of the Southwest Key immigrant detention facility used to house children whose parents are being prosecuted for immigration violations.